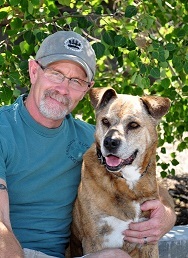 Living with multiple dogs is something that dog trainer Dennis Fehling, CPDT-KA, CBATI of Friends for Life Dog Training in Central, Oregon and his wife Pam have had a lot of experience with – he presently has 7 adopted dogs! Dennis shares great information on how to make multiple dog households run smoothly, what to do to keep all the dogs relaxed, peaceful and satisfied, as well as considerations that trainers should be aware of before adding dogs to their already existing dog families. I don’t know if it’s too late to submit a question (hope not!) but I’ll give it a try. Great pod cast. Mr. Fehling and his wife should be rewarded himself for rescuing so many dogs and giving them a loving home! I’m just curious . . . what would Mr. Fehling recommend if he had a dog that did not respond to toy or food as a reward for good behavior. For instance, if Flash did not respond well to using a toy every time he saw Beau and he tried food and it too didn’t work. FYI: I’ve had that experience with a dog where toys, food (even roast beef), excitable petting, calm petting seemingly did not reward a certain dog for good behavior. Thanks so much! Your reply made good sense and it was a big help. I really appreciate the time you took to give me such excellent advice. Thanks again! Best to you and your wife for much success with all your dogs and the other ones you help outside of your home!